Thomas Rehbach has been a preschool educator, an administrator, a respite carer, a teacher, a courier, a soccer coach and referee. He’s lived in the area long enough to see kids he’s taught now becoming parents and teachers themselves. Tom was born in Australia to German parents and grew up in Rosehill. At age 9, Tom and his brother went to live at Dunmore House, a boys’ home in Pendle Hill. After hitchhiking from Sydney to Cairns a few times in the early 1980s, Tom came back to the Northern Rivers and never left. He met his partner, Gail, through Clunes Preschool when they both had sons who were attending. The couple live in Clunes with Gail’s daughter Laura and Laura’s son, Toby. The blended family includes four children and four grandchildren, with one more due to arrive later this year. Tom has built a career out of caring for kids and helping them achieve the best they can. 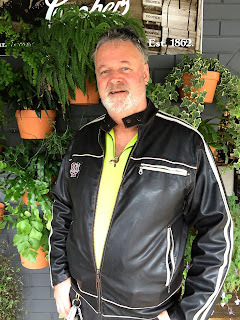 Currently combining his roles as co-ordinator of after school and vacation care at Clunes Public School, General Assistant at Lismore High School and casual teacher, he’s taken opportunities as they’ve come to him, and rarely turns down a new challenge. Tom has a degree in Primary Education and a Diploma in Early Childhood Education, but he’s one of few males in a female-dominated industry. “When I was at TAFE I was the only bloke out of about 40 women,” he says. Working as a respite carer was eye opening and good for the soul, says Tom. “I’d take my charges with me wherever we went, take them to family things or out,” he says. Spending time with family, in particular his grandchildren, is one of Tom’s biggest loves. As someone who’s been actively involved in community life, Tom knows a lot of people. “If I’ve got to go into town and I don’t need my own vehicle, I’ll just hitch and it’s amazing who picks you up. They see you around and they know who you are. Some people say, ‘oh I never pick up hitchhikers but I’ll pick you up’. I mean, some people will actually drive past and do a U-ey and come back and get you because they feel bad that they haven’t done it,” he laughs. Tom spent many years on the committee for COSA, supervising Work for the Dole projects, as well as playing and refereeing soccer. For the past few years he’s also coached the Eureka women’s soccer team. As a referee and as a teacher, Tom values the notion of a common set of rules that everyone can adhere to. His philosophy is that if you get kids to engage with creating rules, then they’re less likely to break them. At university, Tom researched playground handball and its rules, trying to find the history of the popular schoolyard game. “The idea of my project was that if you have everybody, the participants, designing the rules, they’re more than likely going to play by them,” he says. Tom visited schools, interviewing kids about the rules, and then videoed them playing the game. Watching the videos, kids then began to recognise instances where they hadn’t complied with their own rules. At work, Tom laments the current depart-mental ban on riding bikes or wheeled toys, even at after school care. “The reality is if they don’t have a safe place to do it, where are they going to do it? Kids learn through play… if you put stuff out, they learn to do it,” he says. At the café where we sit, another former student of Tom’s walks past and says hello. Tom waves and smiles.